“Up in the Big House, they’re branding niggers!” Danielle Dax gleefully warbles in her song, “Evil Honky Stomp.” A tape-loop of a sinister trumpet plods along with a collage of strummed and plinked sound effects. “Ugly boys with pious mouths,” she coos. The matter of race and the master narrative is skewered and laid bare in this song. Though, “song,” perhaps, is not really accurate. Dax’s first two albums are free-form assemblages of found sound, performance art, and dark parody. Her voice alternates between a high, piercing Kate Bush-like soprano and deep, dark Siouxsie-like contralto. Dax addresses a variety of subjects and issues with her bizarre surrealistic imagery. “Pariah,” a stark synthesizer-driven bit of cold-wave, addresses the racism faced by West Indian immigrants in London, and subsequent work addressed sexism, animal rights, and female genital mutilation. But Dax never took the role of scold. Rather, she was a silver-tongued sibyl, using allegory and arcane allusion. 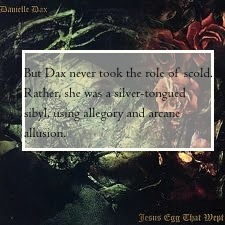 Her first two albums, Pop-Eyes and Jesus Egg That Wept were all written, produced and performed by Dax by herself. They are a mash-up of various forms of music, ranging from Bollywood pop, madrigals, funk, synth pop and other hybrids. Dax plays, with varying levels of skill, saxophone, flute, sitar, banjo and toy instruments. Later work was more sophisticated, adding psychedelia and electronica to the mix. Her song about the Thatcher years, “Bad Miss M,” is a bouncy country-flavored tune. Dax left the music scene after a bid to become more mainstream failed to take off. Marketing was probably an issue. Dax had all the makings of an alternative pop star, with her appealing voice and stunning good looks. But her vision was too wacky and uncategorizable. Was she Goth? New Wave? Pop? World Music? Would Siouxsie fans find her too pop? Would Laurie Anderson fans find her too dark? Ultimately, a long bout with illness effectively ended her music career. Today, Danielle Dax (nee, Gardner) is a landscape architect who dabbles in music.